Whispering Pines, Norfolk Island. Information, Photos and Reviews. 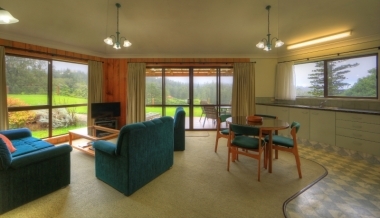 Nestled close to the edge of the Norfolk Island National Park, Whispering Pines Cottages sit around the ridge line overlooking the stunning slopes and valleys covered in iconic Norfolk Island pine. Just out of town, but quiet enough that you find yourself getting lost in the view of the stunning natural scenery with the ocean just off in the distance beyond. With 7 cottages in total, two groups of two and one group of 3, these cottages make the ideal setting for small families or groups of friends travelling together – offering close proximity but still allowing for personal space. All cottages are fully self-contained with modern and spacious kitchens with open plan living and dining rooms. There are 5 cottages with 2 bedrooms and 2 en-suite bathrooms, and 2 cottages with 2 bedrooms/1 bathroom. Sit on the front veranda, enjoy a BBQ and watch the sun go down over the mountain. Nobody has reviewed Whispering Pines yet, Be the first. You are submitting a booking enquiry. Whispering Pines will then contact you by email with details of availability and prices.